Bolsonaro administration Chief of Strategic Affairs Maynard Santa Rosa last week announced new Brazilian mega-infrastructure projects that include a dam on the Trombetas River, a bridge over the Amazon River, and an extension of the BR-163 highway from the Amazon River through 300 miles of rainforest to the Surinam border. The Trombetas region contains 4 indigenous reserves, 8 quilombo communities and 5 conservation units. In his radio announcement the official provided few details on the projects, saying nothing about costs, where the money to build would come from, what the socio-environmental impacts might be, or the timeline for the construction. With Brazil’s Bolsonaro administration not even a month old, the new president’s Chief of Strategic Affairs last week announced plans to build a bridge over the Amazon River in Pará state in order to begin developing what he called an “unproductive, desertlike” region ­– a reference to the Amazon rainforest. The projects to be built include a hydroelectric dam on the Trombetas River, a 1.5 kilometer (0.9 mile) bridge over the Amazon at the small town of Obidos, and an extension of the BR-163 highway from Santarem north to Brazil’s frontier with Surinam, a distance of roughly 480 kilometers (300 miles). The general has named the project the Barao do Rio Branco Plan in honor of the 19thcentury diplomat who negotiated border treaties with Brazil’s neighbors. He made his announcement last week in an exclusive interview to the official radio program Voz do Brasil, thus avoiding any hard questions on the project’s feasibility or environmental impacts. He said the dam will boost Brazil’s energy capacity, providing electricity for aluminium processing and putting an end to frequent power outages in the cities of Manaus and Boa Vista. The BR-163 extension, if built, will allow for the trucking of grain from the Brazilian interior to the nation’s northern border. He said the project would also have other, unspecified, benefits. The southern section of the BR-163 already exists, running hundreds of miles from Mato Grosso state north to the river port of Santarem in Pará state. The highway is currently used by agricultural producers to transport soy to the grain terminals at Mirituba and Santarem on the Tapajós River, where it is transferred to ships for the trip down the Amazon River for export to the European Union and other nations. General Santa Rosa did not explain how extending the road hundreds of miles north through dense rainforest to an uninhabited border with Surinam would benefit soy exporters. He also made no mention of the indigenous and quilombo populations (the descendants of runaway slaves) who live in the area that he described as desertica – a totally inaccurate word with which to describe the world’s largest tropical rainforest and its inhabitants. For Lucia Andrade, executive coordinator of the Pro-Indian Commission, a Brazilian NGO defending indigenous rights, the project will put at risk “a region of the Amazon which is a mosaic of indigenous and quilombo areas and conservation units of great importance, not only to the population who live there but to the entire planet. To call it an unproductive latifundio is a big mistake.” The Trombetas region contains 4 indigenous reserves, 8 quilombo communities and 5 conservation units. 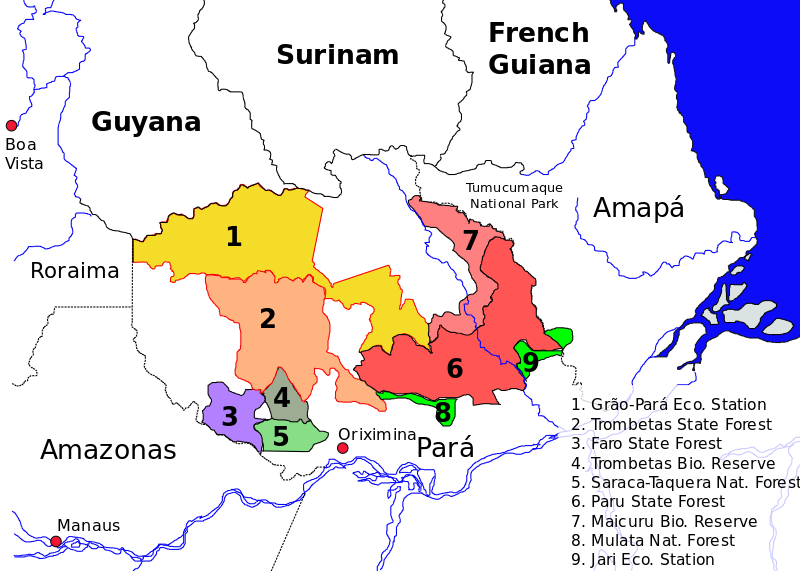 Protected areas of northwest Pará state. The BR-163 extension from the Amazon River north to Surinam, though a precise route has not been announced, would diminish the integrity of several of these preserves, likely including the The Grão-Pará Ecological Station (Estação Ecológica Grão-Pará). Managed by Pará state, this preserve protects 42,458 square kilometers (16,393 square miles) of Amazon rainforest, and is one of the largest fully protected tropical forest conservation units in the world. This map does not include indigenous reserves or quilombo communities. Image by Aymath2 courtesy of Wikipedia. She added that, at a time when the Environment Ministry has been deliberately weakened and responsibility for environmental licensing has been transferred to the Ministry of Agriculture, the Barão do Rio Branco project is extremely worrying. General Santa Rosa’s announcement represents the latest in a long line of mega-infrastructure projects, proposed over the last 50 years by both military and civilian governments to “develop” the Amazon by means of roads, dams, industrial waterways, railways, and in this case, a major bridge. General Santa Rosa’s description of the project seems reminiscent of the position of Brazil’s military dictatorship which ended more than three decades ago, and treated the Amazon as an empty wilderness, while disregarding the cultures and livelihoods of indigenous and traditional populations who have lived there for centuries. Brazil’s 1988 constitution rejected this outmoded mindset in which the Amazon rainforest – valued today for its human and natural diversity, and vital to maintaining global climate stability – is seen instead as a physical obstacle that must be overcome to benefit the advancement of Brazilian agribusiness and mining commodity development and export. The Bolsonaro administration, by naming its project after the Barão do Rio Branco, seems intent on not only honouring a Brazilian diplomat, but also harking back to the 19th Century’s exploitative attempts to build railways to export Amazon rubber. In recent decades, the government emphasis has shifted to large-scale infrastructure schemes by which to export soy from the Brazilian interior via new roads like the BR-163 in the Tapajos basin, the BR-319 in the Maderira basin, the proposed Grainrail, and a number of Amazon industrial waterways. General Santa Rosa did not mention Brazil’s legal requirement for environmental impact assessment studies or environmental licencing, but if the proposed dam involves the flooding of indigenous territories, authorization from the National Congress will be needed. Also, the indigenous communities must be consulted under national and international law, including the International Labour Organization’s Indigenous and Tribal Peoples Convention (No. 169), of which Brazil is a signatory. Several ministries will be involved in the planning, and the project is expected to be officially announced within the next two months by means of a presidential executive order, which will prevent any initial congressional scrutiny. However, the president’s order must be approved by the legislature within 90 days, or it is nullified. Yet the biggest obstacle to the Plan is likely to be financial, as the proposed projects would require billions of dollars in investments. In his interview, General Santa Rosa did not mention any cost figures, or where the money will come from at a time when Brazil is subject to strict austerity measures with a tight limit on government spending.